Introducing Wednesdays Word. I thought it might be interesting to introduce you to some unknown and known words of the Italian language. Words which we may use already without realizing they’re part of the Latin Italian language. In the cooking world of language there are so many universal words coming from different parts, French, German, Italian…and I know you’ll be pleasantly surprised at how many you do know from the Italian language. 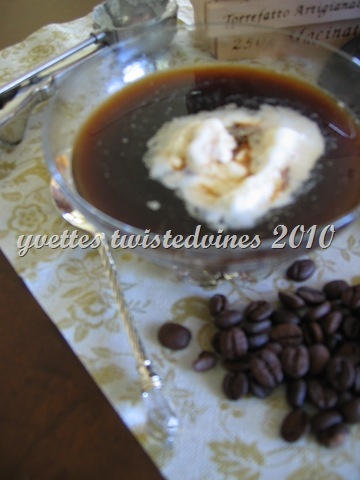 You’ll find this coffee based beverage or dessert on every restaurant or bar menu. It’s your choice what you want to put in your espresso. A scoop of vanilla ice-cream. A white or chocolate “tartufo” which is white or chocolate coated ice-cream. A touch of rum, whiskey or how we like our affocato al caffè with a touch of nocino, at the end of a Winters evening meal. For the recipe of nocino see here. 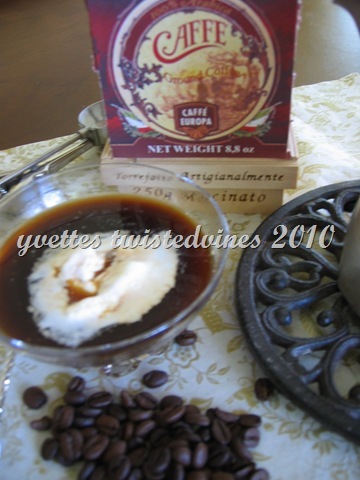 It’s the same as an iced coffee but it’s served hot and with strong espresso coffee. How many of you know the word? How many of you have tried one? Let me know, I think we can have some fun learning “new” words…and another language together. What a super fantastic idea you have here! You can be assured I’ll be tuned in every Wednesday. I have never tried this, but you can bet I will be tonight…I have more cherries to can, so a spot of espresso should do the trick. I can’t wait until next Wednesday! I love an affogato. Whats not to love, its espresso with icecream. A firm favourite on a weekend in summer.